Planning is an important part of many areas of life. Many people do not plan for certain unpleasant end-of-life scenarios, however. 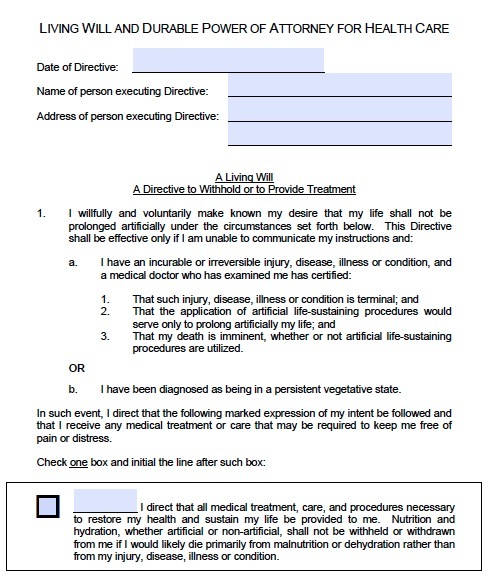 Advance directives enable you to plan for future treatment you will receive in cases where you cannot choose your treatment because you are unconscious or your brain function has greatly deteriorated. Idaho features two types of advance directives: a living will, and a durable power of attorney for health care, although you can complete both in one form. The durable power of attorney allows you to appoint someone to make any health care decisions for you, such as receiving certain types of medications or undergoing a particular type of surgery. One part of the form allows the principal to limit this authority only to specific actions. So you can allow the agent to have power only over refusing certain types of medications, for example, but not any other decisions. But the agent may not withhold life-sustaining treatment unless you specify that with a living will. You also have to be in a state of permanent, irreversible unconsciousness, or have an incurable disease or condition that will result in your death, and life support is merely prolonging life artificially. Although these matters are unpleasant to consider, your family and physicians must decide how to treat you in this event, and they may not know your precise wishes.